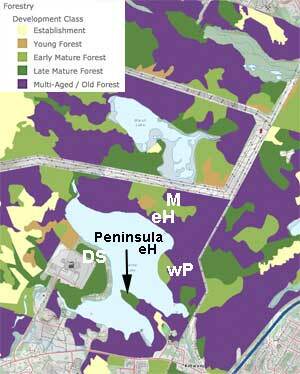 A lot of the forest in Sandy Lake and Environs is in Late Mature and Multi-aged Old Forest stages as shown in the DNR map at right. 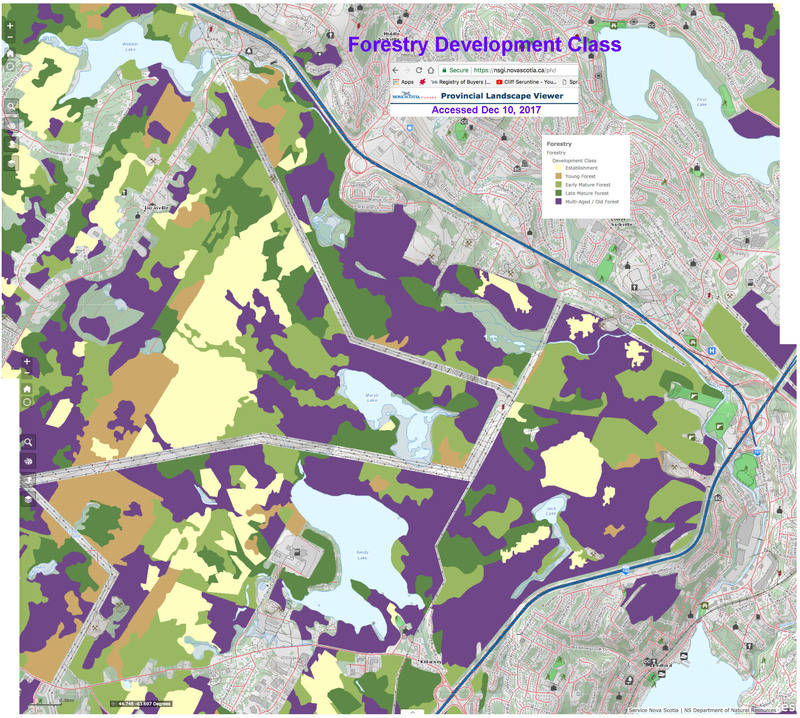 Those maps are based on interpretation of aerial imagery and such assessments need to be additionally assessed on the ground to draw firm conclusions but, in general, my ground observations concur with the DNR map designations. “Old Growth” is a popularized term whose definition is a bit vague; that’s in part because we have so little, true Old Growth anywhere today, several centuries or more of no disturbance being required to develop the full suite of Old Growth characteristics. So commonly the term “old forest” is applied to avoid complication of definitions. 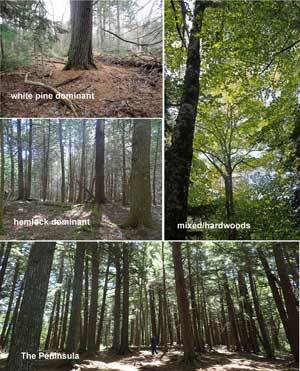 The Nova Scotia Department of Natural Resources (DNR or NSDNR) has devised an Old Forest Scoresheet. Through my more or less “random walk” field trips, I identified three sites on the east side of Sandy Lake that represent 3 major types of older forest stands in Sandy Lake and Environs and with the collaboration of Colin Gray, Old Forest Coordinator for the Mersey Tobeatic Research Institute, assessed those stands for their Old Forest status according NSDNR’s standard scheme on October 4 and 6, 2017. 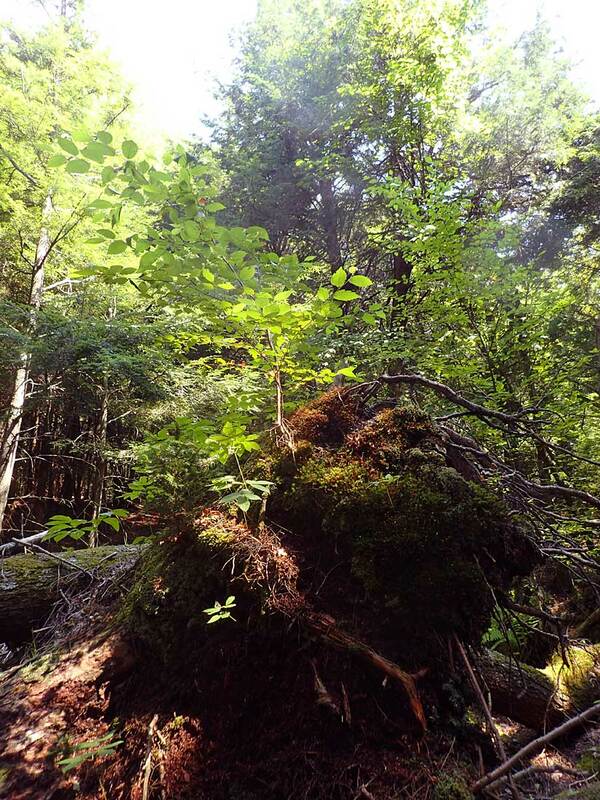 A “Peninsula Hemlock stand” had been assessed for its Old Growth status on Oct 3, 2014 by local resident and professional forester Ed Glover and Matt Crouse from NSDNR.View Old Forest Assessments for the detailed results. In the DNR protocol, the ages are determined on the 3rd largest tree (assessed by dbh, diameter at breast height) in each of three plots for each site. Ages of the oldest trees for the three stands we assessed fell in a narrow range: 134 to 141 years. One tree, not the largest, in a lakeside, hemlock dominated stand on the west side of the lake was aged and came in at 126 years, so close to the 134 to 141 year range. The Peninsular stand trees were older by 60 or 70 years. An explanation for the coincidence of ages for the three stands in this study, and for the older age of the Peninsular stand is suggested by a prominent feature of these forests: a “pit and mound” topography. Basically the concept is that hurricanes drive a lot of the natural forest dynamics in Nova Scotia (and in temperate and tropical forests elsewhere); hurricane winds going through an old growth forest can blow down down the largest trees, resulting in pits where the bases of the tree once stood, and mounds where the uprooted bases once stood. 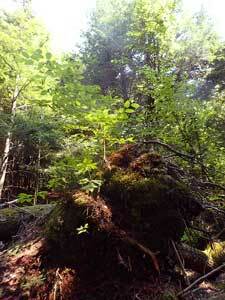 Only very large, old growth trees leave mounds that are still evident 100+ years later. The mounds are preferred sites for seedlings to get established. So the age of the oldest trees on mounds that we see today plus perhaps 10-20 years represents the time since the wind disturbance that caused blowdown. So… the 134 to 141 year range could represent a major wind event about 150 years ago. So the 134 to 141 year range corresponds pretty well to Dwyer’s “A common age of forest stands in Nova Scotia is 100 years”, and perhaps the storm represented by the pits and mounds over much of Sandy Lake and Environs are those storms of 1869 (Saxby Gale) and 1873 (The Nova Scotia Storm). What about The Peninsula? Based on its location which would be more sheltered, also the much more limited blowdown I viewed there now than elsewhere (that likely associated with Hurricane Juan), an explanation is that it was not so affected by those storms, but was by a storm perhaps 60 years earlier. View Dwyer’s chart for some possibilities. This is all a bit of speculation and would require detailed scientific study to really sort it out, but it makes sense. While Dwyer wrote about the topic in 1979, our documentation and understanding of pit and mounds in Nova Scotia is still somewhat in its infancy. 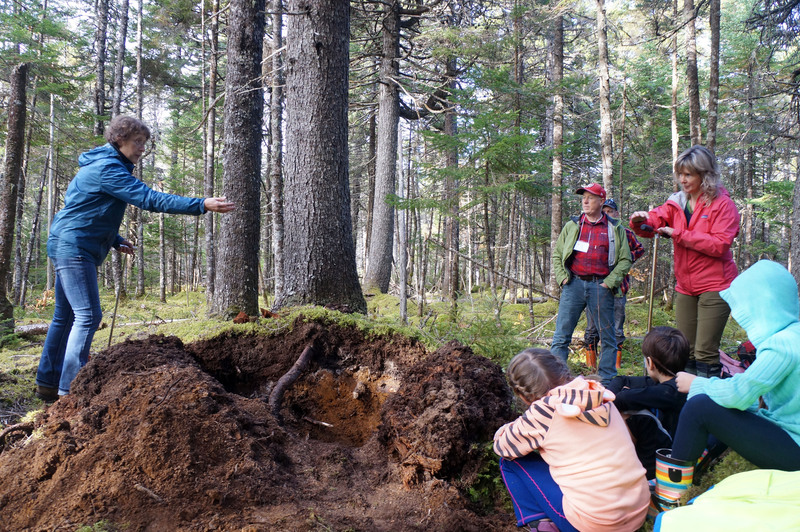 That’s been changing through studies of pit and mounds in Nova Scotia by Dr. Elena Ponomarenko with the collaboration of Keji forest ecologist Donna Crossland; more recently Dr. Ponomarenko has been working with NSDNR. Another aspect that Dr. Elena Ponomarenko/Donna Crossland have elucidated is that sometimes these blowdowns were followed by fire, revealed by layers of charcoal in the soil profile. profile and residues of the tree that formed it. I was fortunate to attend a field trip led by Dr. Elena Ponomarenko and a lecture by Keji forest ecologist Donna Crossland on pit and mound topography as part of the MTRI Old Forest Conference in October of 2016. As a follow-up of what I learned there, I made some measurements on the pits and mounds at the three sites that Colin Gray and I had assessed for old forest status. View Pit and Mound Topography for details. One set of observations involved determining the direction of tree-fall for the pits and mounds, and for recent tree-falls probably associated with Hurricane Juan. Those suggest that both historically and recently, the winds causing the tree falls came from the south to southeast, which is consistent with a hurricane hypothesis. Interestingly, I subsequently learned that Bob Guscott, a retired DNR forester, had made similar observations on pits and mounds in the area of Grand Lake with near identical results. Since then we have been collaborating as part of a “pit and mound working group”. Pit and mound topography is lost when forests are intensively highgraded (the biggest trees removed) or clearcut, so their presence is evidence of longstanding processes, longer than the age of the trees. These are “old process” systems as ecologist Nick Hill likes to call them. 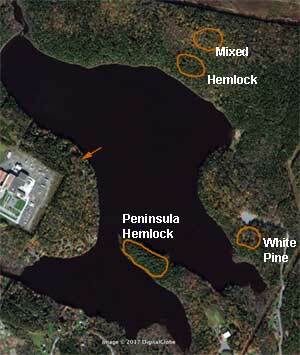 While a lot of forest harvesting occurred at Sandy Lake and Environs, there are patches that were either missed or only lightly harvested and today support Old Growth forest (as describe above) and that also have well developed pit and mound topography; these areas provide special opportunities to study the natural history of the Acadian forest more or less as it existed in pre-colonial times. One feature that seems to be largely restricted to such Old Growth/Old Process sites: close physical association of yellow birch and hemlock, which I have called the “Acadian Forest Love Affair“. There is lots more that is interesting (or better, “fascinating”) and more to come on these pages about the pits and mounds in Sandy Lake and Environs. The story has practical implications for how we view and manage and even experience these forests.